Despite British officials ramping up security and warning of looming terror threats, it seems the security arm GCHQ can still be outsmarted by drunken hoax callers. Downing Street are currently reviewing security procedures following a hoax phone call received by Prime Minister David Cameron on Sunday, from a man pretending to be the head of GCHQ. According to British authorities, the telephone call was “quite brief,” as Cameron hung up when he realized the man was, in fact, not the spy agency chief, Robert Hannigan. In a separate incident, the hoax caller, who has not been named, also accessed the Hannigan’s personal telephone line. “Following two hoax calls to government departments today, a notice has gone out to all departments to be on the alert for such calls,” a government spokesperson said. 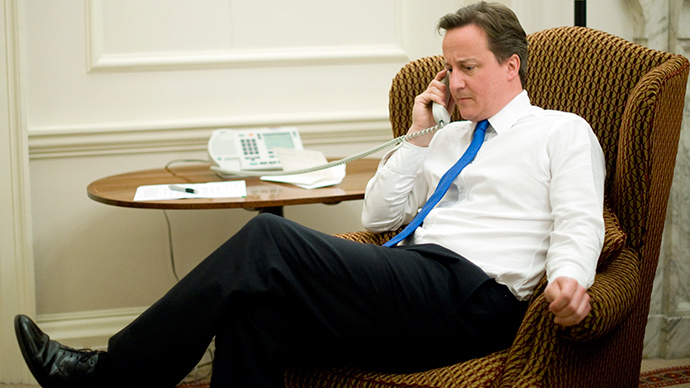 “I've just made complete monkeys out of GCHQ. I've got the mobile number of the director,” he said. While Downing Street hasn’t released further details regarding the hoax caller, it is known that they were able to access Cameron and Hannigan using a standard office ‘switchboard’. Cameron is not the first prime minister to be caught out by a prankster. Former Prime Minister Tony Blair was duped by a radio DJ pretending to be then-leader of the opposition, William Hague. The news comes as industry magazine Computer Business Review found 34 percent of companies are turning to private security firms to protect them from communications interceptions or other forms of cyber-attacks.